Are you ready to spend more times taking in the beautiful view of your backyard? If so, having a sunroom installed from the experts at Pro Home and Sunrooms is a great way to do just that. We are the area’s largest TEMO dealer and are proud to offer this high-quality, American-made brand to countless homeowners. We offer sunrooms in a variety of styles but a popular choice for those that are looking to enhance the aesthetic appeal of their homes is our conservatory sunrooms. This unique style of sunroom is available in either a square Edwardian or faceted Victorian style to complement the aseptic you have built for your home. Whether you are looking for a way to increase the living space of your home or to just find a new area to unwind and read a book, this style will allow you to do that while taking in the appeal of the classic European beauty after which it is styled. 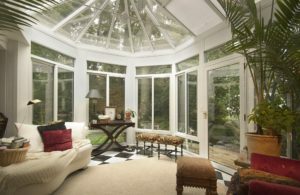 To learn more about the conservatory sunrooms we offer to homeowners in Rochester, NY, and the surrounding communities, contact Pro Home and Sunrooms today. When you do, one of our knowledgeable team members will happily answer any questions you may have about our products and installation services.